The extent of the public’s response to Nike’s latest campaign, fronted by former NFL player Colin Kaepernick, might have been something the company did not fully anticipate. In a span of 24 hours since the deal was made public via Twitter, the company received more than US$43 million worth of media exposure, according to APEX Marketing Group. The direction taken by Nike has proven to be far more advantageous to its profile than any expected downside, according to Bob Dorfman, sports marketing executive at Baker Street advertising. Importantly, it has proven that Nike, especially to its current fleet of sponsored athletes, is a smart and conscious non-risk averse organization capable of making smart business moves. Nike has refused to comment, and though its shares dipped on Tuesday, the move has hardly proven to have a negative impact on the brand. Nike and Kaepernick’s partnership has been in existence since he entered the NFL in 2011. This new ad bears the phrase, “Believe in something. Even if it means sacrificing everything” that is testament to the perils of Kaepernick, who has faced backlash since he knelt during the US national anthem as a form of protest against racism and police brutality in 2016. The ad has understandably drawn anger from those who view Kaepernick and his contemporaries as individuals who have disrespected America, with many posting videos of themselves burning Nike apparel or cutting the trademark Nike ‘Swoosh’ from their garments. Others though, have taken an unprecedented step of endorsing the ad, namely former CIA director John Brennan, Iran’s ex-president Mahmoud Ahmadinejad and tennis star Serena Williams. Some though have criticized the marketing move, including US President Donald Trump, who expressed that the ad sends a “terrible message”. Simeon Siegel, a senior retail analyst at Nomura Instinet, called it a power move by Nike for being able to understand impressions and image better than other companies, and thus being able to pull off this controversial campaign. Nike seems to understand its customer base well, which is made up of individuals mainly under the age of 35, and are ethnically diverse. 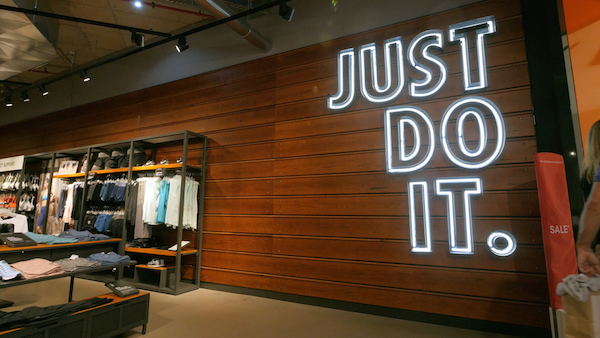 Though this move will probably result in some short term customer losses for Nike, it is likely to appease and importantly, appeal, to the kind of customers that Nike really wants—the trendsetters in the long run. Nike also plans to create a Kaepernick-inspired shoe and t-shirt design. The money will be donated to Kaepernick’s ‘Know your Rights’ campaign.